Привет! And welcome to episode 26 of Russian Made Easy. Как дела? Всё нормально? So, сказал and сказала are the masculine and feminine forms of a past tense verb in Russian. Let’s see if we can figure out what the verb means. Did you say “skazala” with an “a” sound? I was talking with Vadim. I was talking with Karina. Now ask the same question to your friend Olga. Now, how would you ask that to your boss? We of course have the rhyme..ВЫ…сказалИ . We’re about to segue into our tip of the day, and as we do, I want you to think about something. What’s the difference between “I was talking” and “I said”? I mean, in both cases your mouth was open and words came out. How do they differ? The difference between “said” and “was talking” is basically one of process versus a one-time thing. What I mean is, when you say, I was talking with Mom, it creates a feeling of a conversation…the whole process of talking with someone. Whereas “I said” gives the feeling of a one-time action. You said one particular thing, and that’s it. This idea of emphasizing a process versus a one-time action is known as “verb aspect” in linguistics. We solve this in English usually by using verbs that end with “ing”. For example, I was walking in the park.…You get this feeling of a long stroll. You feel the process of the walk. But if I say: I walked to the store. You see the result. It was a one-time, completed action. Ya lovil. I was catching (or, I was fishing.) That’s the process form. Ya poimal. That’s the one-time, completed action. So you have a word starting with an “L”…lovil….And a word starting with a “P” sound: poimal. 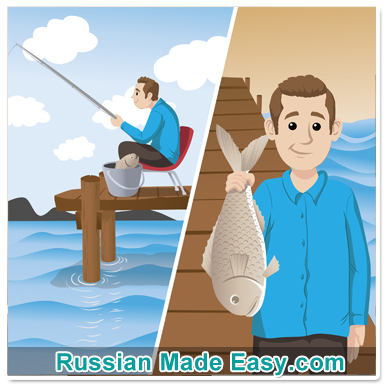 Two totally different verbs for the exact same action of catching fish. The only difference is “lovil” creates the impression of the process of catching, whereas poimal is a one-time thing. You caught one fish, and that’s the whole action. The strategy of using two different verbs for this seems unique to Slavic languages like Russian and Polish. It’s one of the things that makes them seem to exotic to us. But if you understand this fundamental concept about verb aspect — the idea of an ongoing process versus a one-time, completed action — you’ll have a very bright future in Russian. Alright, let’s get back to it. Listen to this short conversation. Mike is offering Olga a piece of pizza. Нет, спасибо. Я не хочу пиццу. Я сказала что я не хочу! Listen to her last phrase again. What’s that third word? She said: Я…. сказала ….что …я ….не хочу. In this construction: Я сказала что…. Try saying: She said that she doesn’t want pizza. Она сказала что она не хочет пиццу. He said that he doesn’t want beer. Он сказал что он не хочет пиво. I said that I don’t like to dance. Я сказал что мне не нравится танцевать. I said that I don’t want to eat. Я сказала что я не хочу кушать. So you rush out and buy him some Chinese takeout. But when you deliver it to him, he pushes it away, saying, Нет, спасибо. But you said that you want to eat. Но Вы сказали что Вы хотите кушать. Imagine you just got off the phone with Greg, who said he doesn’t want a salad. Try saying.. I was talking with Greg. He said he doesn’t want a salad. Он сказал что он не хочет салат. Imagine you come home and see that your wife has cooked you a big mound of Russian pancakes. Not being hungry, though, you decline. So she says…. You said that you like pancakes. Ты сказал что тебе нравятся блины. You said that you like caviar. Ты сказала что тебе нравится икра. Yes, I said. But I don’t want. Да, сказала. Но не хочу. You said that you will have a beer. Ты сказал что ты будешь пиво. Да, но я не хотел Балтику. She said that she didn’t want. Она сказала что не хотела. She said that she not want. Она сказала что она не хотела. Imagine your friend’s phone rings. It’s her dad. A minute later she hangs up. She said she wants coffee with milk. Она сказала что она хочет кофе с молоком. You’ll use this construction a lot whenever you’re having to translate for people. Imagine you’re in Russia with a friend who doesn’t speak Russian. Any time he tries to communicate, you’ll have to translate for him, and you’ll often frame things with that construction. He said that….whatever. Jeff said that he wants to eat. Джэфф сказал что он хочет кушать. Maria said that she doesn’t want pig fat. Мария сказала что она не хочет сало. Abbott said that he wants to dance. Аббот сказал что он хочет танцевать. …and so on. So try working this very common construction into your daily practice routine. As the one person in your group of friends who now speaks both languages, you’ll end up using it a lot. Keep up the great work and I’ll see you in the next episode! study. Someday I will and for now if I skip a few days, I always catchup and review. I’m glad the lessons are always there for me. Glad you’re enjoying my podcast. And yes, playing with a new language is a great way to get comfortable with it. 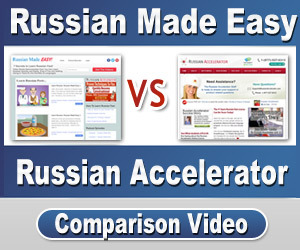 We’ll turn you into a confident, conversational Russian speaker. I promise!